This time on Go Forth And Game I’m talking to Dennis Hoyle and James Tanner of Bellwether Games. Bellwether is an up and coming company that publishes the award-winning Drop Site. Tom: Welcome to Go Forth And Game guys tell us about yourselves. Dennis: I am 25, just recently graduated with my MBA from Mississippi State University, married to the lovely person and brilliant strategy gamer, Sara, and I am passionate about using games to bring people (physically) to the same table to enjoy each other’s company. As a “day” job I work as a Residence Hall (college dorm) Director at a public university in Illinois. James: Dennis and I started playing boardgames with a few others back about 10 years ago. It started with lengthy war games like Risk and the classic Shogun. Eventually I wanted something more and ran into Twilight Imperium. Instead of buying this expensive game, I decided to do some research. I found that some of it’s basic mechanics were founded in some game I had never heard of called Settlers of Catan, which eventually lead to Puerto Rico, and now my shelf is full of Euro-games. I worked at Motorola in Libertyville, Illinois designing mobile phones for about 12 years and have recently taken a job with Google in Mountain View, California. Tom: So you’ve been gaming together for quite a while. Very cool. Tell us about how Bellwether got started. Dennis: Bellwether Games has been in our minds to do ever since 2008 when we started talking more seriously about game design as a profession. After getting my MBA, I wrote a business plan and continued to design games on the side. Through a competition at the university, our Bellwether Games business plan won $5,000 in start-up funds, which we are just starting to put to work for us. We decided on the name “Bellwether Games,” because the term “bellwether” is synonymous with being a leader in an industry, and it is our aim to develop games that are leaders in innovative and elegant mechanics and that are extremely fun. We also felt that the image of a sheep with a bell around its neck was a strong, unique, fun and positive image, and you can see from our logo how we have integrated the bellwether into our branding efforts. Tom: That is an interesting story. I like your ‘philosophy’ of the company and how it is displayed by the logo. Neat. Ok, so now for your first game – Drop Site. How did it come about? What is it about? 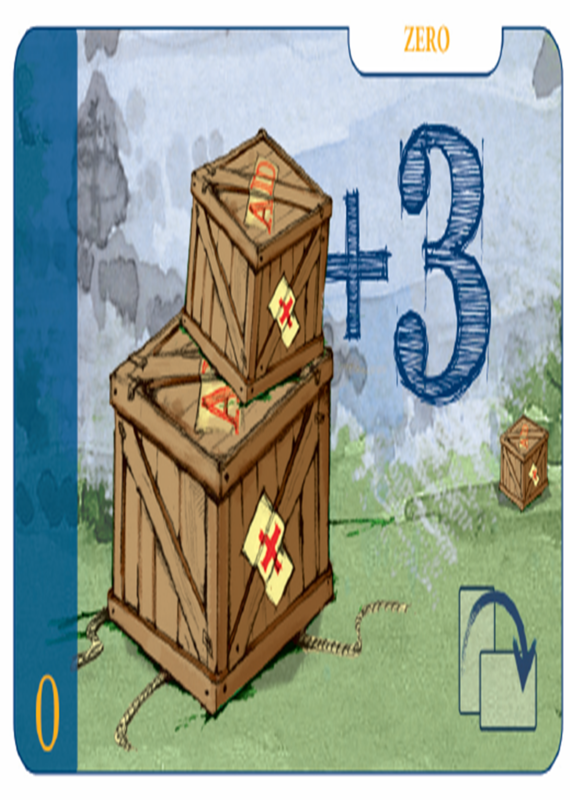 Dennis: Drop Site is a pretty simple strategy card game about delivering humanitarian aid. It was influenced by Lost Cities The Card Game, but plays even faster and has some extra layers. In the game, players “drop” crates of aid toward the ground, represented by piles in the middle of the table. At the same time, players hide cards face-down that represent people in need. The round can end very quickly, and at the end, the cards that were played face-down are compared with the cards that are still face-up in the middle of the table. You score points for all the matches you make, but if you don’t play carefully you will lose points for non-matches. It’s really fun, plays quick, no two rounds are the same, and you will discover more layers to the strategy the longer you play. The game really started as something completely different, but as many game designs go, it transformed into something new and better. I distinctly remember working on Drop Site one Saturday morning and just praying to God that I could get the mechanics to work right. My wife was helping me play test various tweaks in the rules, and then suddenly it came together. The game played exactly as I wanted, so I posted the rules to my blog. About a week later I heard about the 2010 Premio Archimede game design contest in Venice, Italy, and shortly thereafter decided to submit Drop Site. for free. 6 months later we are now marketing those copies to the public and planning the release of our next two games, Over a Barrel and Aristocracy. Tom: Wow! So you’ve already won a gaming award. That’s awesome. The video does a great job of explaining how to play and increasing excitement for the game. You mentioned that this game changed from initial concept to final product. Could you elaborate? Tom: Art. Who does the art on Drop Site and how did you find your artist(s)? Dennis: As part of the Carta Mundi prize, the artist was found for us and did the artwork for free as part of their contract with Studio Giochi. The artist’s name is Paolo Vallerga, from the company ScriBabs, which is located in Italy. He did an excellent job with the game, and we would definitely work with him again on future projects. Tom: A strategy chaser or filler is a good niche to fill. How do you go about designing or developing a game? What comes first, mechanic(s) or theme? Dennis: Sometimes theme comes first and sometimes mechanics come first. When I get an image or idea for a world that I want to experience or that I want other players to experience, I design the game around capturing that experience and look for a mechanic to match. At other times there is a mechanic that I feel like would make a great game and then the trick is finding a theme that mirrors the mechanics, and also generates interest. James: I’ve spent some time trying to understand from where the origin of board game design comes and am not quite sure except for the general understanding that necessity is the mother of invention, as well as T.S. Eliot’s quote, “anxiety is the hand maiden of creativity.” I always enjoy lying awake all night worrying about how I’m going to make something work. I’ll even think intensely on the issue before I fall asleep in hopes that I’ll wake up at 2:00 AM worrying. Our forthcoming game Aristocracy came out of a desire to play Risk with cards, which truly is unlike Risk. Over a Barrel came out of the desire to have a travel game where the buying and selling price was the same price for each stop. In Over a Barrel we developed a physical boat mechanic, which came out of the need to organize data into information. Tom: I can empathize with you James. I’ve had game ideas that just would not let go. I used to play Risk a lot as a kid so Aristocracy sounds neat. While we are on game design, what is the hardest part of designing a game? Dennis: Following-through. Ideas are easy to come up with, it’s taking that idea and working on it and tweaking it continually until it takes shape into something truly special that is the hard part. Second to that is divorcing yourself from an idea or mechanic that you’ve been using in order to make a better one. It’s hard to “give up” on a mechanic or idea that you’ve put a lot of work into, but you need to realize that every mechanic is just a bridge to another better mechanic. James: I believe the original spark is the most difficult. That starting spark must contain a single unique concept. The rest of the design follows that spark. I also think finding a responsible and free artist to be a difficult task. Tom: Oh man, do I agree with both those points. I’m terrible with follow-through. I’ve a couple of games in various stages of progress that I need to get finished. Deadlines work pretty good though. And I’ve heard the ‘throw out your baby’ idea from several designers as one of the keys to changing a good game to a better game. Finding the unique among many ideas is a fantastic point. You want something that stands out and offers gamers something new. Great responses. Now, play testing seems to be a mixed bag. While absolutely necessary, it can be slow and difficult. What is the hardest part of play testing a game? James:Play testing is the perspiration of design. It’s not fun playing a broken game 100 times. It’s also difficult to understand when it’s fixed because after playing the game 100 times it still hurts to play the game. Tom: What a great way to put it James. Yeah, sometimes play testing is not fun. And I have the same issue with asking friends to play test for me. It seems imposing upon their game time. Why did you choose to become a game publisher? Dennis: I feel like modern board games are a very refined form of art, and they fascinate me. James introduced me to them about 8 years ago and I have not looked back. I knew I wanted to work in the board game industry, but I wasn’t sure to what degree or in what role. In 2008 I visited Hans Im Gluck in Munich and took part in one of their game nights. It was an awesome experience. A lot of famous people in the board gaming world were there including Andreas and Karen Seyfarth (designers of Puerto Rico and Thurn and Taxis) and Bernd Brunhoffer (designer of St. Petersburg and Stone Age and owner of Hans Im Gluck). Brunhoffer very graciously took some time to talk to me about game design and publishing, and it wasn’t long after that that I decided to start a company of my own. Then, after Drop Site won best card game at the Premio Archimede, we felt like the time was right. Tom: What a cool experience. Awesome story. Next is a question I ask everyone – What are some aspects of a good player? Dennis: I believe that the optimal strategy for each game lies along a continuum. On the one end is planning and calculation and at the other end is intuition and making decisions without all the information. Some players are excellent at calculation and planning, but don’t succeed as well when they have to make intuitive decisions. The best player is able to do both and most importantly is able to adapt to each game’s optimal strategy. James: I’ve learned that from play testing all types of players are necessary. The extremely intelligent Euro-game players will find the holes in the mechanics, but the non Euro-game players will find problems with the artwork, rules, and more-obvious mechanics issues. I’ve learned, apart from play testing, a good player is gracious, competitive, quirky, and creative. Tom: The continuum idea is a neat one that illustrates your idea well. And play testing again shows just how important it is. Who’s work in the industry do you admire the most? Dennis: No surprise here. Probably Bernd Brunhoffer, both for the reasons already mentioned and because I often cite St. Petersburg as being my favorite game. James: I’d have to say Andreas Seyfarth is straight genius. His games bring such good feelings. You know it’s a good game when you take last, yet still enjoyed and admired the mechanics of the game. I think his Puerto Rico is the greatest game ever, but I also enjoy Thurn and Taxis, and Manhattan. I also admire Reiner Knizia for all of his brain teasing games, but I think his games can be a bit abstract which sometimes mitigates fun and causes analysis paralysis. Tom: I enjoy both those designer’s games. I played both Puerto Rico and Stone Age for the first time recently and agree that they are fantastic. Now to your games. Of them, which is your favorite? Dennis: Hard to say because they are each very different. Right now I feel a very strong desire to play Over a Barrel again, so maybe that is my favorite. James: I still most enjoy playing Aristocracy. It’s just a fun game to play in a social environment, especially playing in teams. Dennis: Drop Site, Over a Barrel, Pillars of the Earth, Ticket to Ride, Bang! James: I just played 7 Wonders twice last night; I took 1st and 4th (last). Tom: What’s the coolest part of being a game designer/company owner? Dennis: Seeing the amazed looks on people’s’ faces when you talk about what you’ve been working on. Tom: What problems, if any, have you had with production? Dennis: No significant problems yet. Shipping Drop Site from Belgium to the States came with a host of challenges, but nothing too bad. Tom: What is next for you? Tell us about your current projects. Tom: I’m very intrigued about both of these games. I want to see these unique mechanics and bits. And a deck de-construction game sounds very cool. Can you give us any more info on these two? Dennis: We are very eager to get both of these games out, and have been hesitant to reveal too much until our play testing is done. Blind playtesting for Over a Barrel is set to begin at the end of July (and yes, Tom, you are being highly considered for this, so you might get to play the game for yourself), and we hope to have it published by the end of this year. Still, we can say that Over a Barrel has a unique physical component, “the ship,” which is an actual wooden boat, and barrels that you load onto the boat. 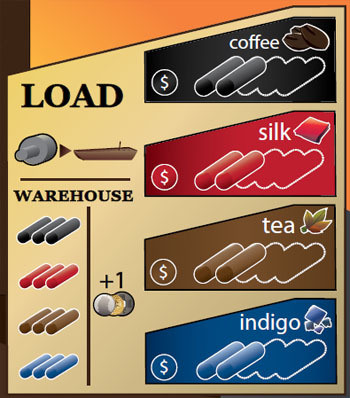 The supply and demand of each good changes at every port, so as you play you are trying to maximize your “profit,” but the trick is that there is a limited capacity on the ship, so your well-laid-out plans for scoring big can fall apart when your barrels start getting pushed off! As you could imagine, this game has been very difficult to develop (we started in 2008), but the hard work has paid off and we believe it is going to be really special. Tom: I so want to play that. It sounds really cool. Where can people fin out more about Bellwether Games? Are there any links or sites you want to direct us to? Dennis: www.bellwethergames.com is the hub for everything Bellwether. 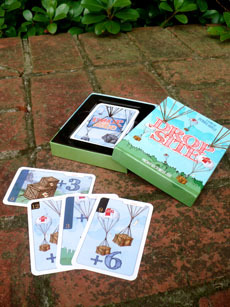 If you want a copy of Drop Site you can only get it at bellwethergames.com. Sign up for our newsletter at: http://bellwethergames.com/my-bellwether/subscribenewsletter.html or contact us at info@bellwethergames.com. You can also follow us on twitter (bellwethergames) or Facebook (Bellwether Games). Dennis and James, thank you very much for being my guests on Go Forth And Game. It has been a lot of fun learning about Bellwether and your games. Drop Site sounds really fun and I’m hoping to see a copy of Over A Barrel or any other of your games (hint, hint) soon. I think Bellwether has a bright future ahead. Now for a BIG surprise. 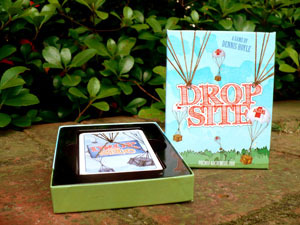 Bellwether Games is giving away a copy of the award winner Drop Site to one lucky reader of Go Forth And Game. All you have to do is visit the Bellwether Games website. Find the answers to the questions below. Then email those answers to goforthandgame@gmail.com. You will receive one point for each correct answer plus an additional point for signing up for the Bellwether newsletter. We will tally your scores. The person with the most correct answers wins. If there is a tie, we will randomly choose a winner from those with the most correct answers. Here are the questions. What are the recommended number of players for Drop Site? What organization does Bellwether Games support? In what century will the theme of Over a Barrel be? What is one website that has reviewed Drop Site? What is Bellwether Game’s slogan? What award did Drop Site receive? How many different voices are featured in the Drop Site tutorial? 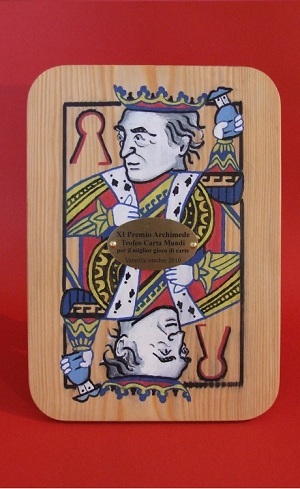 The contest will run until the end of August 2011. So get on over Bellwether Games, find the answers, then shoot Go Forth And Game an email with your answers. And why not leave a comment while you are here.